Owning an iPhone or some other iOS device is sort of a heavenly feeling, because first time it’s like a dream coming true! The feeling doesn’t take long to rot when the iTunes software on your computer denies connection with your iPhone with the computer and shows the annoying error “iTunes Could Not Connect to this iPhone”. Follow our guide below to fix this error. This odd error has been faced by too many Apple users and even at the time I’m writing this article, so many people somewhere in the world are having the trouble. This just does not happen with iPhones, but also iPod and iPads. 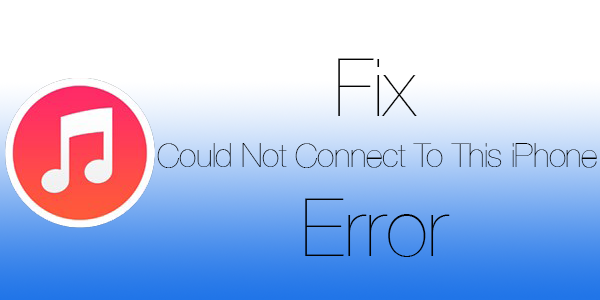 When the error occurs, everything that requires iTunes comes to a halt like transferring music or data, taking backups etc. iTunes could not connect to this iPhone. This value is missing. iTunes could not connect to this iPhone. This device is no longer connected. iTunes could not connect to the iPhone because it is locked with a passcode. iTunes could not connect to the iPhone because the device timed out. iTunes could not connect to this iPhone because an unknown error occurred. Try a different USB Port – There might me improperly installed drivers on your computer. Sometimes even trying something as silly as trying a different USB port works like a charm. Unplug the USB cable from your computer and try another one. If there’s a hardware issue with the port, it should be solved now. Change the USB Cable – The USB cable you use might be broken inside. After a prolonged usage period, if improperly handled, the internal components of the wire often breaks down or gets loose resulting in malfunction. An original cable costs kind of like a fortune, but it is always suggested to buy the authorized ones. You could also get better quality replicas. Terminate ATH.exe process – The process ATH.exe often engages the driver and hardware specs required to connect an iOS device to iTunes. As a result, your computer won’t detect any device connected and show the error we are talking about. Simply right click on Taskbar and open ‘Task Manager’, click on Processes tab then find ATH.exe. Press ‘delete’ on your keyboard and confirm. Restart Everything – If you have tried everything pointed above, time to reboot your computer. Before you do so, you can even try a reinstallation of iTunes on your computer. Check if there’s any version or software conflict with iTunes and some other software. Check if the error goes away after restarting your computer. Check your iPhone or other device – The USB port on your iPhone or other iOS device could be faulty. Internal components could break down due to applied extra pressure while plugging the cable into the socket. If you are unsure, drop your phone by an authorized Apple service center. Even though the error is very common, it’s often caused by very silly reasons. Just in case the first four suggestions don’t work, stick to the fifth one. Apple professionals will take good care of your iPhone and fix the issue.